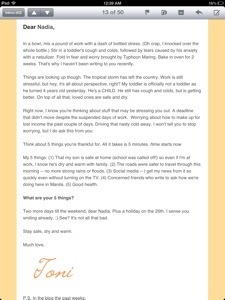 I have been receiving Toni Tiu's Wifely Steps Newsletter for some time. I love how she reaches to her readers through this regular newsletter. Reading her letter makes me feel closer to someone I haven't known nor seen in person! I have been reading your newsletters since I started receiving them in my email but this is the first time I'm clicking the reply button. Why? Your Maring story just fitted so well with our own rainy day(s) blues. My mom's cough and colds were joining the loud rains the past few days. We woke up to a flooded house ( water was up near our ankles) last Tuesday. And now, just as we are about to rejoice with that dash of sunlight passing through our window, I heard my toddler cough! Oh no! Not now my dear son. Work has piled up and I just can't be as cool as what my husband always tell me whenever I hear Rio cough in the middle of the night. 1. My loving husband -- He was at home just in time to be our main "taga-limas" guy when water started to enter the house. 2. FB messenger -- Chatting with my high school batchmates until the wee hours kept me smiling and laughing during these gloomy rainy days. 4. Nanaystrip's blogging again! -- After almost a month, I finally posted a blog entry! 5. Rio - My two-year old son who makes me happy everyday, rain or shine. That's it Toni. Thanks for being a constant inspiration to all of us. I think I just raised my level from being a blog reader to Wifely Steps' blog pal! Looking forward to Toni's letters and hoping she gets my answers too.